Tough yet functional, this slim, lightweight silicone cover provides custom-built protection for your Samsung Galaxy S8+, without getting in your way. Designed for your Galaxy S8+, this stylish cover provides easy access to all ports and controls, and it's compatible with a Qi wireless charger. Keep your Samsung Galaxy S8+ safe from knocks and bumps with this robust silicone case. It snaps onto your phone smoothly, and the soft, micro-fibre interior ensures your S8+ remains scratch-free. If you want to preserve the stunning good looks of your Galaxy S8+, a decent case is essential. 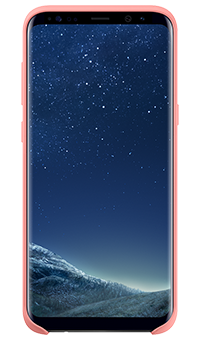 This sleek silicone cover in pink is the obvious choice – crafted by Samsung to hug the S8+'s trademark curves. Designed by Samsung for the Galaxy S8+, this silicone cover gives you easy access to all the ports, buttons and jacks. And it's even compatible with the Qi wireless charger, so you can stay connected without ever removing the case.